A couple of weeks ago, I took a look at the US Army's opinion of Rotatrailer. It wasn't exactly an overwhelming success, and though Ordnance knew that Rotatrailer wasn't the answer they were looking for, they still had some bizarre concept that a trailer would be a good idea. They had already tried testing the General Motors Caisson, T8, but that wasn't the end goal either. So, between May and September of 1942, they tested Trailer, Armored, T32, manufactured by Deere and Company. The description stated: "The vehlcle is of' the two wheel unsprung type weighing 2450#. It is designed to carry a load of approximately 2200# in an armored cargo box. The cargo body is of the rectangular form and is mounted centerly between the two wheels. [...] The tongue is provlded viith a lunette for coupling to prime movers and a retractable prop to hold lhe tongue up in a raised positlon when the lunette ls uncoupled. The vehicle is equipped vrlth 2 wheel hand brakes, rear mounted reflectors and black-out lights. The vehicle is also equlpped vith a towbar for coupling the vehlcle to various tanks and it can be convenientiy carried on the tongue when not being used." The front and top were 1/4" armour, the sides and rear 3/8." It looked kindof like this. To test it, they towed it behind an M3 Medium, an M7 HMC, and an M3 Light. During a test at 20mph, the towing tank missed the curve, and slid into a ditch. The trailer slid in after it, bending a wheel hub. It was also discovered that the trailer's hubs were starting to crack with the use. Strengthening was added, the bent hub replaced, and testing continued. "When the trailer is couple to a tank and drawn over muddy terrain, considerable mud is accumulated on the top of the cargo compartment, the tongue frame, and the tongue frame attachments which are the battery boxes, light switch and the hand parking brake lever assembly. The mud on the top of the cargo compartment can easily be disposed of by opening the top coveres and allowing the mud to fall off. This isn't objectionable. However, the portion that is accumulated on the tongue frame and its attachable members is objectionable: It greatly increases the tongue weight, the mud has to be cleaned off to apply the parking brakes and light switch, and if they're not cleaned they will corrode. Finally it works its way into the battery boxes." Neither did they learn their lesson about backing up with a tank, after the incident with the Rotatrailer. "While conducting a portion of the road test at night, the vehicle was damaged. The operators were backing the tank with the trailer coupled to it when the trailer turned sideways and the tank track hit the tongue members. The left member was bent down approximately 2" and twisted. The right was twisted slightly. The vehicle was repaired, but the tongue remained slightly bent." It wasn't the only tank reversing problem. When attempting to couple a tank to the trailer, it reversed too far and again damaged the tongue. Things didn't get much better for the cargo. For 200 miles, the vehicle was operated with 95 rounds of 75mm ammunition in cloverleaf containers. There was no means to secure the ammunition in the vehicle, so they just piled the ammo loosely in the cargo compartment. In addition to being bounced around, the cargo compartment also accumulated some mud and water through the gaps by the doors. This is what it looked like after only 40 miles. By the end of the test, the ammunition containers had been jostled so much that some had broken, the ammunition damp, both damaging it, and making it hard to remove from the containers. On the plus side, there were footman loops so that 5-gallon cans could be secured, 54 could be carried. That test was found satisfactory. The brakes were not great, only able to hold the loaded trailer still on a 12% slope. Overall, though, the vheicle generally passed the tests. It was recommended that, with the addition of some modifications, the veheicle be adopted as a suitable fuel and ammunition trailer to be towed behind tanks. The tongue needed to be strenghthend, some modifications to the brakes, the cargo compartment doors enlarged to reduce mud intake, and the battery boxes relocated. So what happened? Honestly, I'm not sure. 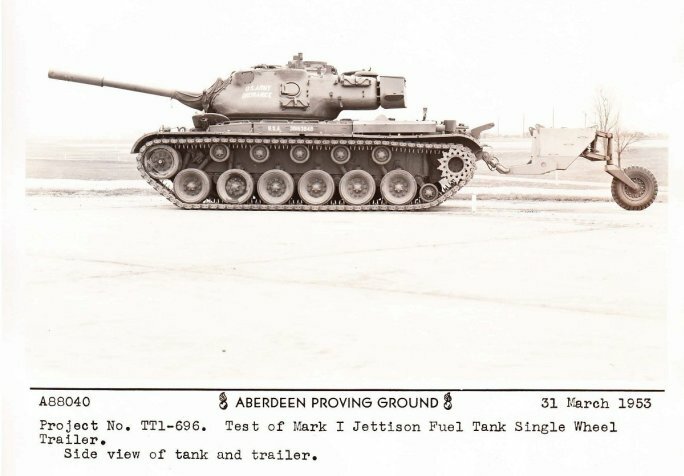 The only time I've seen photos of US Army tanks towing trailers, they were the open-topped M8 and M10s, and I've only ever seen them being towed behing the 105mm howitzer armed tanks. The flame thrower tanks were not averse to using trailers, of course, witness Crocodiles, but with that notable exception, gun tanks tended not to use trailers until the 1950s, when it was looked at again as a method of increasing fuel range. British variants, unpopular as they were, entered service behind Centurions, whilst US attempts were, perhaps blisfully, discarded. For those of you who don't know, I've a Facebook page here , and once in a blue moon, I stream at http://www.twitch.tv/the_chieftain, probably late afternoon Pacific time.